Thanks to Dog Tipper for this fun graphic! A Happy, Fun and Safe Thanksgiving to all of our readers! We are beyond grateful that so many of you choose to visit our blog each day, take the time to leave comments and participate in our giveaways. We realize that without you, we wouldn't be able to share our vision of a world where no pet goes without a loving home (and high quality products!) We are truly grateful for your support, not just on Thanksgiving, but everyday. Of course, we pet bloggers are especially grateful for our pets, and amid all the frantic cooking and baking, and the comings and goings of friends and relatives, it's still important to make sure your pooch has his or her daily exercise (tough we know!) and doesn't overindulge with treats. (Notice we said overindulge, there's a dog writing this post you know!). 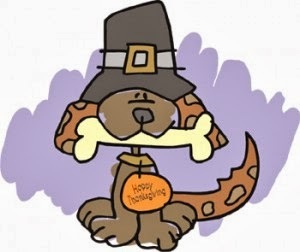 We firmly believe that small amounts of unadorned turkey and potatoes—at least— are fine for Fido on this special day, and most other days, too. But in case you're interested in additional "do's and "don't's" for keeping your pet in tip-top shape through the long Thanksgiving weekend, check out these tips from our friends at the ASPCA. We didn't know about the possible gastrointestinal upsets from sage...whoops! Hope y'all had a wonderful Thanksgiving! 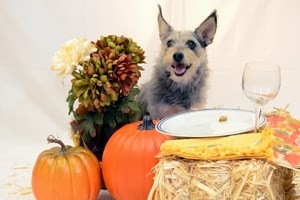 We hope you had a wonderful Thanksgiving, Bocci!